The Ecosmart ECO 27 is a tankless water heater from that uses the Smart Technology developed by Ecosmart. It’s one of the best water heaters available in the market and finds itself in the high end tankless range. Employing effective heating systems and technology, the Ecosmart ECO 27 is a highly energy efficient water heater that can significantly lower your monthly energy bills. Ecosmart enjoys a good reputation around the industry for their innovative technology and performance oriented products, and so far, the ECO 27 is living up to its bill. The Ecosmart ECO 27 water heater is configured on climates where the incoming temperature of water can be as low as 37 degrees. It’s a powerful water heater that can generate 3 gallons of water in just a minute. It’s also the largest electric tankless water heater that employs the Self Modulating Technology (SMT). SMT basically regulates the energy consumer to heat water when needed. In other words, your Ecosmart ECO 27 is ideal for Jacuzzi tubs, Roman style tubs, and other large water outlets. The Ecosmart ECO 27 water heater makes use of a digital temperature control that allows it to provide better accuracy with every increment of 1 degree. It is basically built to meet the demands of homes, offices, and areas where there is high water demand of high flow rate. The main unit employs three 9 KW Emerson electric heating elements using copper heat exchanger and brass tops to avoid electrolysis. It requires three 40 DP breakers, and features an automatic resettable thermostat. 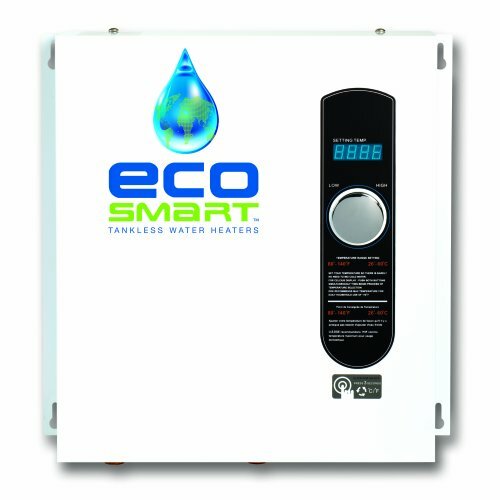 Despite being such a high end electric tankless water heater, the Ecosmart ECO 27 is quite user friendly and easy to set up. The heater is quite compact and doesn’t take up much space. In fact, you’ll be saving more than 12 cubic feet of space with the Ecosmart ECO 27 over traditional tankless water heaters. For installing, you just have to have a look at the manual and follow the instruction to set it up perfectly.However, if you have problems in installing Ecosmart ECO 27, then always consult a professional.The design is quite stylish, appealing, and goes well in homes that embody a minimal theme or décor. The Ecosmart ECO 27 features a digital display that is located just above where the knob is, and allows you to easily set the temperature. You can set up the heating temperature by 1 degree increments, which accounts for consistency across the heating elements. This in turns helps in conserving your energy bills. While the unit is quite compact in size, it does deliver more powerful performance than most electric tankless water heaters. We all know that tankless water heaters are designed for energy efficiency in general, but no model fits the bill more than Ecosmart ECO 27. The SMT provides automatic power adjustments that rapidly convert water as it passes through the heating system. In the long run, you can actually save up to 60% on your heating costs. And if you’re wondering whether the components are durable, Ecosmart is offering lifetime warranty on its ECO 27 models. In other words, you know you’re getting a great water heater for the price that will work consistently over the years. When you start the device, it can have mildly fluctuating temperature, but that settles after a few minutes. If you live in a large home in some of the colder parts of the world, then the Ecosmart ECO 27 is the ideal tankless water heater for you. It’s highly practical in large homes, offices, or areas where the demand for hot water is high, or where the flow rate of water is generally high. So does that mean Ecosmart ECO 27 is not practical for small homes? If you’re willing to pay the price, then why not! But speaking generally, Ecosmart ECO 27 is practical for homes or areas with high hot water demand. There’s not much to say when there is so much good to an electric tankless water heater that makes it the cream of the crop. The Ecosmart ECO 27 is definitely an innovative water heater in terms of size, style, functionality, and above all, performance. While it is priced in the high end water heater range, there is no denying that Ecosmart ECO 27 will offer better ROI in the long run over other tankless water heaters. If you take into account that you can save up to 60% on your heating bills, you will realize that you’re saving more down the road than investing today!